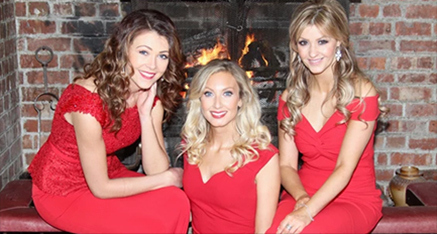 The sensational classical crossover trio from Wales, sees classically trained sopranos Ellen Williams and Gwawr Edwards and mezzo-soprano Sioned Terry, come together in harmonious union to sing operatic arias, crossover favourites and popular songs. They have pleased audiences to standing ovations on their premier tour and have recently released their debut album ENCORE on the label Sain Records, featuring Welsh favourites such as Calon Lân, classical repertoire: Puccini’s O Mio Babbino Caro and Caccini’s Ave Maria, and popular songs such as Moon River and Bridge Over Troubled Water. The trio came together in concert one midsummer’s evening in 2017 and since then have been busy performing across the country at prestigious events such as the FAW Awards Evening, at many corporate engagements, and for numerous television and radio appearances. In November Chris Needs made ENCORE Album of the Week on his popular Radio Wales show. Collectively the trio have performed as soloists at many of the UK’s most prestigious venues including The Royal Albert Hall, Bridgewater Hall, Cadogan Hall, Royal Concert Hall Glasgow, in Llangollen International Esiteddfod and the National Eisteddfod of Wales, in St. David’s Hall and the Wales Millennium Centre, at many international sporting events, and internationally in North and South America, Europe and Asia. Athena can bring a touch of glamour, elegance and sophistication to any event, and are able to provide entertainment across a wide spectrum of occasions. The trio has an extensive repertoire and have great experience in working with harmonies. Athena perform with backing tracks to orchestral scores, with live band, or more intimately with piano accompaniment and are happy to look into any specific musical requests.